His Royal Highness Prince Sultan bin Salman bin Abdul Aziz, Chairman of the General Authority for Tourism and National Heritage, Founder and Chairman of the Saudi Aviation Club, To honor the International Air and Air Sports Association during the meeting of the General Assembly held in Luxor, Egypt, is a tribute to all those who contributed to the support of public aviation in the Kingdom, especially the Custodian of the Two Holy Mosques King Salman Bin Abdul Aziz Al Saud, who has been supported by the Saudi Aviation Club since its establishment. His Highness said in a press statement that his honor today is not only for his person But to those who influenced his life, both his father and his mother and his brothers and trainers and everyone who worked with His Highness or worked with him in the field of aviation as well as his country, which allowed the establishment of the Saudi Aviation Club and supported it was a long period of establishment. He said that he is still practicing aviation and continues to renew the licenses, considering himself a professional pilot and his flight has become not only a hobby but a passion for life, and that aviation has become a large economic sector in the world, whether commercial or public aviation, Stressing the importance of Saudi-Egyptian cooperation in the field of aviation during the coming period. The Saudi Aviation Club is the first aviation club to be established in the Kingdom and works in cooperation with and partnership with the Saudi Aviation Club. Civil Aviation Authority in the application of regulations, standards, and application The highest level of safety, to be a safe flight practice, and simulates the best international levels, and works with the General Authority for Sport to develop and encourage these sports, which are of increasing local and international attention, pointing out that the club is witnessing the development of infrastructure and services. 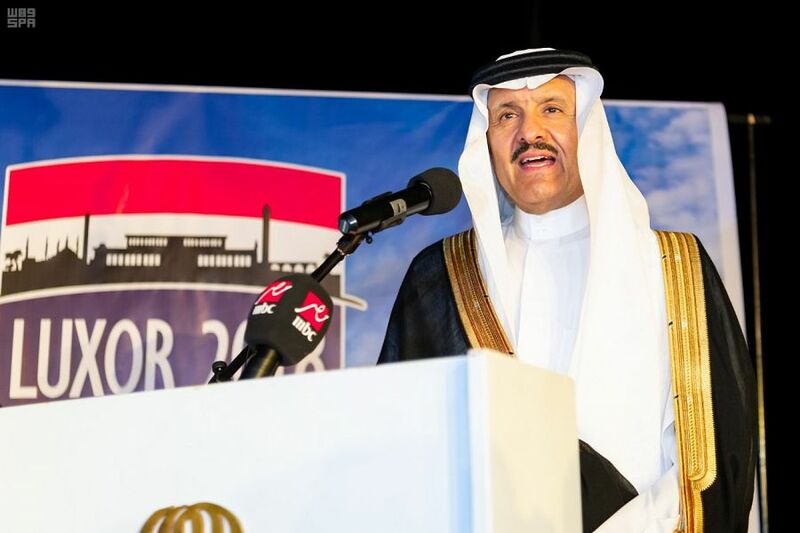 Prince Saud stressed the depth of the Saudi-Egyptian relations, which bring together the leaders and peoples of the two brotherly countries, pointing out Egypt's contribution to the construction of the Kingdom of Saudi Arabia. Prince Sultan bin Salman described the Egyptian city of Luxor as one of the most beautiful cities in the world, praising the generosity of its people and its distinguished location. He expressed his pleasure to visit the archaeological areas accompanied by His Excellency the Egyptian Minister of Antiquities Dr. Khalid Al-Anani. "There will be upcoming visits," He said that there will be an exhibition in the Kingdom of Saudi Arabia for the Egyptian Islamic Museum within 6 months at the National Museum in Riyadh, as well as the exhibition "Masterpieces of the Kingdom's Antiquities", which toured the world and will arrive in Egypt in late 2019. Because the museum will be under construction is still under construction He explained that it was agreed with the Egyptian archaeologist Dr. Zahi Hawass to form a joint Saudi-Egyptian team to explore the Kingdom and train Saudi citizens on how to restore the effects, stressing that Egypt is one of the most important countries in this area. "We are working with the Egyptians in The area of renovation of buildings "urban heritage", and expected to be a forum between the two countries of the ruins soon to be hosted by the Saudi embassy in Cairo.